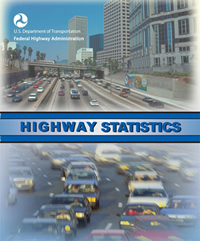 The Highway Statistics Series consists of annual reports containing analyzed statistical information on motor fuel, motor vehicle registrations, driver licenses, highway user taxation, highway mileage, travel, and highway finance. These information are presented in tables as well as selected charts. It has been published annually since 1945. Federal legislation and policy has required this data from the States for FHWA to assess the health of the highway system for Congress, and other interested entities including a host of other users such as State and local governments, the private sector, the media, and the general public.